The NuHumans strike back in this fourth installment of the X-Men/Inhuman war, from the creative team of Charles Soule, Jeff Lemire, Javier Garrón and David Curiel. The X-Men have neutralized what they perceive to be the major threats among the ranks of The inhumans, imprisoning them in the etherial realm of Limbo. The non-combatant Inhumans seem to have been left behind on New Attilan, whereas The Royal Family and their chief enforcers are caged in an energy dome atop a large stone spire, circled by the various goblins and demons of Limbo. Black Bolt is elsewhere, encased in a stasis chamber that appears to nullify his sonic powers. The issue begins with Medusa devising an exposition-heavy plan to traverse the energy barrier and facilitate their escape. It all centers on Crystal and Flint creating a geological parabola which Gorgon uses to amplify his sonic stomp in order to destroy the floor of the spire’s plateau… or something like that. I had thought Gorgon’s stomping power was seismically-oriented as opposed to sonic, but whatever. In any case, the plan succeeds, the energy dome is broken, and The Inhumans battle their way through the hordes of goblins as they descend the spire. Meanwhile on Muir Island, Storm, Emma Frost and the rest of The X-Men are working desperately to come up with a strategy to destroy the Terrigen Cloud before it completely disperses, bonds with the atmosphere, and makes the earth entirely inhabitable for the Mutant race. Bickering with one another and running out of time, The X-Men realize that their best hope is to relocate their teammate, Forge, so that he might recreate a new Terrigen-neutralizing machine. Yet Forge has been captured by the two NuHumans, Iso and Inferno, and The X-Men must hurry to find him as soon as possible. Unbeknownst to The X-Men, the ghostly Inhuman known as Mosaic has infiltrated their operations center on the island and is seeking to utilize his possession-based powers to ascertain the information needed to free Medusa and the other captured Inhumans. 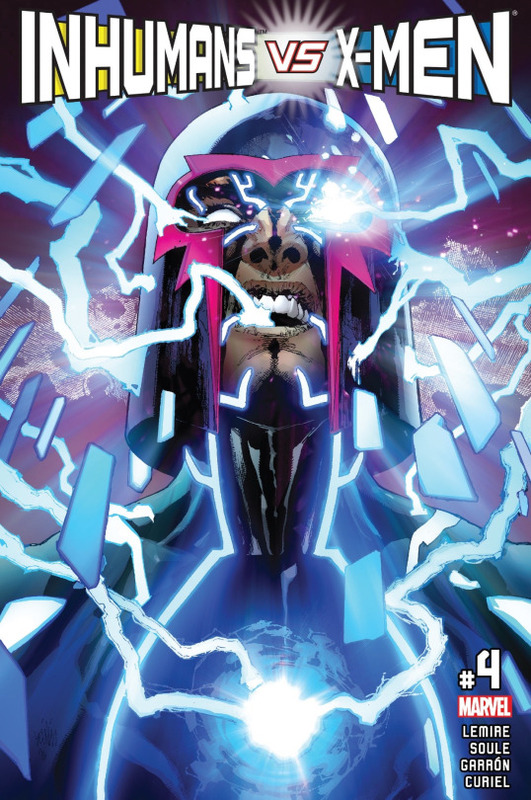 Mosaic has been given instruction by Reader to seek out Magneto and steer clear of the telepaths. Mosaic locates Magneto, possessing him and having him put on his telepathy-impairing helmet before Emma or any of the other telepaths can detect what has happened. 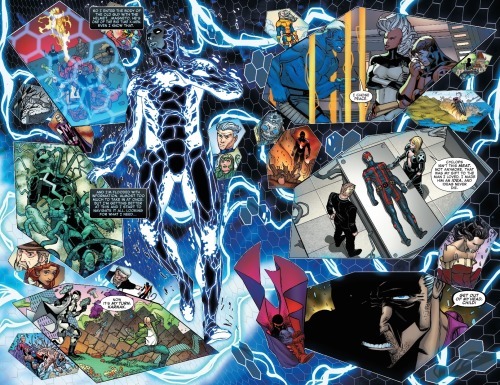 Mosaic is stunned, nearly overwhelmed by the sheer weight of Magneto’s mind and experience; as well as key pieces of information have been thus far unaware of. 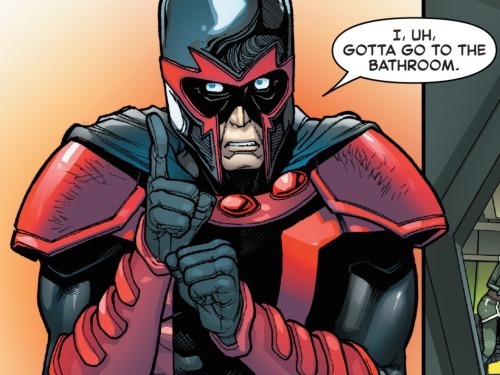 The shock of it all is noticeable to the others and we get a rather funny scene where the possessed Magneto quickly and awkwardly excuses himself by announcing that he has to use the bathroom. The nature of Mosaic’s powers are not exactly psychic, his ‘possessions’ are more akin to neurological bonding as opposed to telepathic mind control. In any case, Magneto’s mind has been well trained to repel psychic invasion and it is not long before he is able to expel Mosaic’s presence. Mosaic has obtained the needed information, however, and now merely needs to find a means of escape. He does this by taking over the body of Cyclops and utilizes his piloting skills to abscond with one of the X-Men’s Blackbird jets. Back in Limbo, Medusa and the other Inhumans have made their way to the Jean Grey School, the portion of limbo that the X-Men have cordoned off as a haven for Mutants fleeing the poisonous effects of the Terrigen Cloud. The Beast had described the layout of X-Haven to Iso over the months they had worked together and Iso presumes that it is most likely that Black Bolt is being held in Forge’s land. As a show of force meant to dissuade any of the young Mutants residing in the school from coming out to make trouble, Medusa has the Human Torch fly up and encase the school in a wall of fire. Medusa is very clear that no one should be hurt, that it is all simply a matter of intimidation. Johnny Storm is nonetheless clearly unhappy about how all of this is unfolding. The Torch still follows Medusa’s orders, but it is clear he is having significant doubts over whether or not he is fighting for the right side. Colossus witnesses this all and reports back to Storm that the Inhumans have escaped. The need to locate Forge as soon as possible takes precedence, however, and Storm cannot afford to send any other X-Men as reinforcements; she tasks Colossus to deal with the matter on his own. Colossus stoically accepts the mission, walking through the wall of flames and engaging The Inhumans. 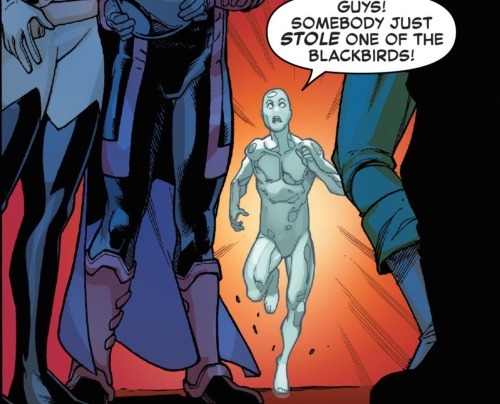 Elsewhere, Mosaic’s stolen Blackbird lands on the coast of New Jersey where Ms. Marvel’s squad of Inhumans await him. Cyclops walks down the Blackbirds gangway and, for a moment it appears that the young X-Men has switched sides. Yet it is merely a head-fake. Cyclops is possessed by Mosaic and collapses into unconsciousness when Mosaic leaves his body. Mosaic has learned from Magneto the location of the captures Inhumans, but shares with Ms. Marvel and the others a far more pressing detail. 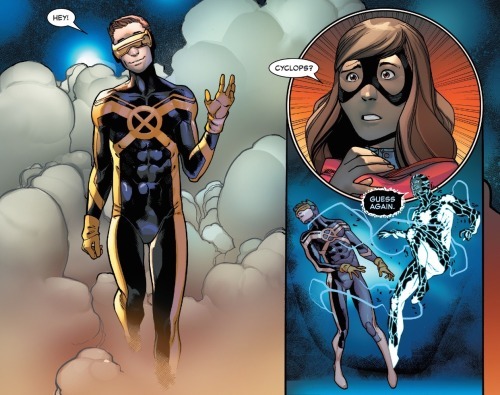 He explains that the X-Men had attacked because the Terrigen Cloud is dispersing into he atmosphere and it is only a matter of days before the entire planet becomes inhospitable to all Mutants. 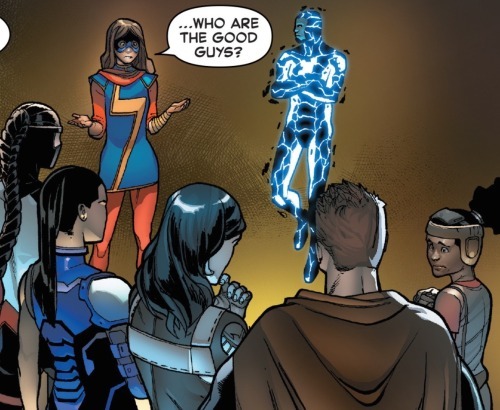 They are all quite shocked, leaving Ms. Marvel to ask the pertinent question: who exactly are the good guys here? And it is here that the issue ends, to be continued in the next installment. The issue doesn’t flow especially smoothly, with the transitions from scene to scene feeling at times more slapdash than seamless. The dialogue is a bit overloaded with exposition and the art looks a touch rushed at places. Still, it’s all worth while for that final scene. 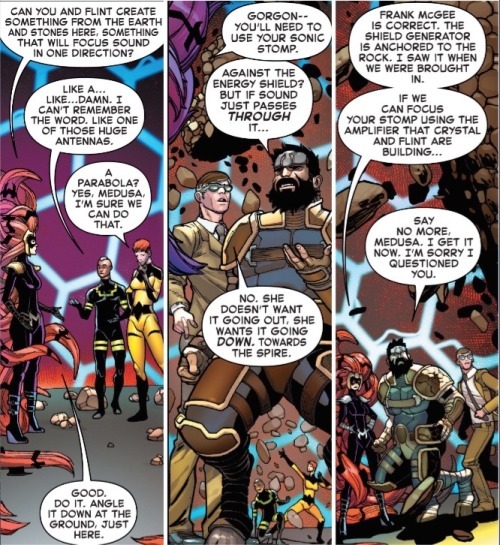 The fact that many (if not all) of the Inhumans do not know the full extent of the threat facing the Mutants drives right at the heart of the main theme of the event. So many conflicts are the product of assumption and ignorance, distrust and not having all the facts… and IvX is no different. The Inhumans are guilty of ignorance… Attilan has been studying Terrigen for millennia and they should have known (or at least detected) that such a thing could happen. 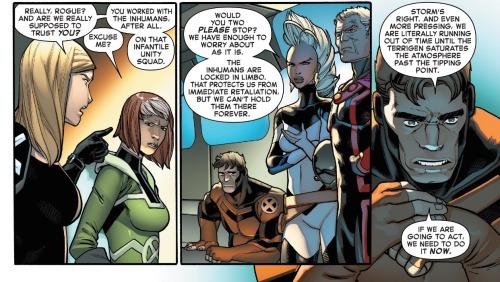 The X-Men are guilty of mistrust; in their desperation, they attacked the Inhumans without bothering to inform them why time was so of the essence. Both are guilty of making assumptions about each other, resulting in a violent confrontation that very well could have been avoided had there just been better communication. As is so often the case, it is the younger members of both sides who are more able to see the forest from the trees and realize that such assumptions must be challenged. Many of the older Inhumans are so entrench in their culture and way of thinking that they see The X-Men’s actions as an effrontery, an attack born out of an unwillingness to compromise. Likewise, many of the older X-Men are also mired in concrete thinking. They have been feared and hated for so long that it isn’t even conceivable to them that The Inhumans might assist were they to know the truth about what is to happen with the Terrigen Cloud. The younger X-Men and Inhumans are less experienced, but also less steadfast in their beliefs. It allows them to be more flexible in how they look at this whole ordeal and it appears as though it may be this specific facet that ultimately ends up saving the day. Garrón and Curiel both do fine work on the art, although there are a few panels that look like they were completed too quickly. I appreciate that IvX has been released at such a rapid pace… it’s a very refreshing change compared to many event books that get bogged down and lose their momentum due to elongated delays. The trade off is that the comics may not always entail an artist’s best effort. The art in Civil War II was just spectacular, yet the long waits between issues really undermined the plot and killed the momentum. Garrón’s work thus far on IvX has been good but not great, yet I appreciate that he is producing a huge number of pages in a relatively short time. This is issue is likely to be the first introduction of Mosaic for many readers and it an excellent center stage debut. Morris is really highlighted as the cool and fun character that he is and I’m hopeful that his involvement int he event will inspire readers to check out Mosaic’s solo series by Geoffrey Thorne and Khary Randolph (it’s just an absolutely fantastic book that everyone should be reading). A fun read. I’m really enjoying how fast IvX is proceeding and, once again, can’t wait to read the next installment. Three and a half out of Five Lockjaws.